When Anna Davis planned her trip to Sendai, a city to the northeast of Tokyo on Honshu Island, she knew she had to stop at Zao Fox Village. As a longtime animal lover, she couldn’t pass up the opportunity to visit a place that boasted over 100 fluffy foxes roaming freely in a natural preserve tucked away in the mountains. 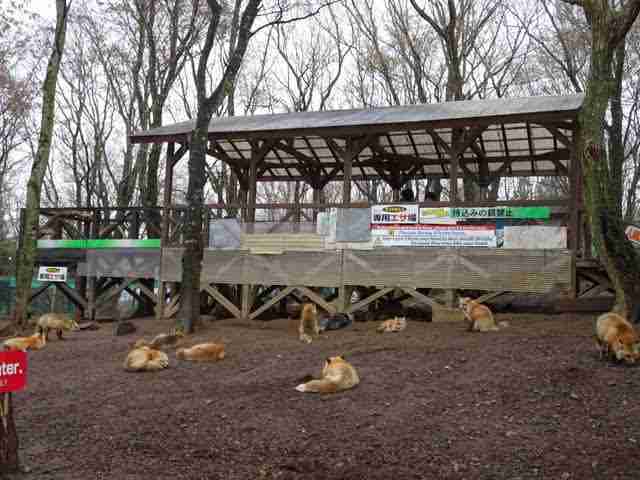 Davis, who volunteers with a wildlife center in New Jersey, hoped Fox Village would be similar to the animal sanctuaries she experienced in the U.S. But when she arrived, she had an uneasy feeling about the place. Approaching the entrance, Davis could see young foxes locked in small wire cages, set up right in front to lure tourists inside. After paying the admission fee, she received a bag of dry food, hard brown cylinders that looked like “dog kibble,” Davis told The Dodo, and an employee introduced the safety guidelines. Davis was instructed not to touch or hand-feed the foxes or risk being bitten. Visitors were also told that if an animal were to become aggressive, they should “stand tall and try to scare them away,” Davis said. The staffer cautioned that while the foxes may look cute and friendly, they were still wild animals. For an extra charge, however, visitors could pet one of the domesticated foxes, and even hold the sleepy animals on their laps. Davis knew then that Fox Village was no sanctuary. As she walked inside the animal park, any illusion Davis had of a fox-filled paradise was quickly broken. 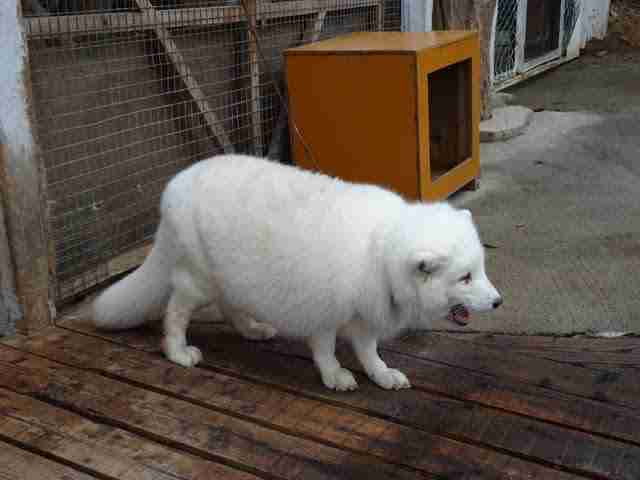 As promised, she saw at least 150 Japanese red foxes, as well as six other rare breeds, including a morbidly obese Arctic fox chained to a post. While inside was far from a natural environment — even worse was the smell. Davis walked a path inside Fox Village’s 18,000-square-foot open-air space known as “hotel street.” On either side of the path, piles of stacked wooden planks served as rest areas for the free-roaming foxes or held wire cages with less docile animals. While some foxes looked healthy, Davis noticed that others were emaciated, their fur patchy and thin. The fur loss reminded her of the animals she had seen being treated for mange at the wildlife center back home. From a wooden feeding platform, visitors dropped food pellets down to dozens of gathered foxes; the animals fought with each other at the base of the structure. But the foxes didn’t subsist on pellets alone — mounds of a cat food-like substance sat on plates around the space. Some foxes followed the tourists around the enclosure, pulling at their clothes and begging for treats. These aggressive begging and fighting behaviors are a symptom of overcrowding, and living in a mid-to-high-stress environment, Rob Laidlaw, executive director of Zoocheck, a wildlife protection agency, told The Dodo. In Japan, foxes primarily inhabit sparsely populated mountainous areas, or the outskirts of villages. 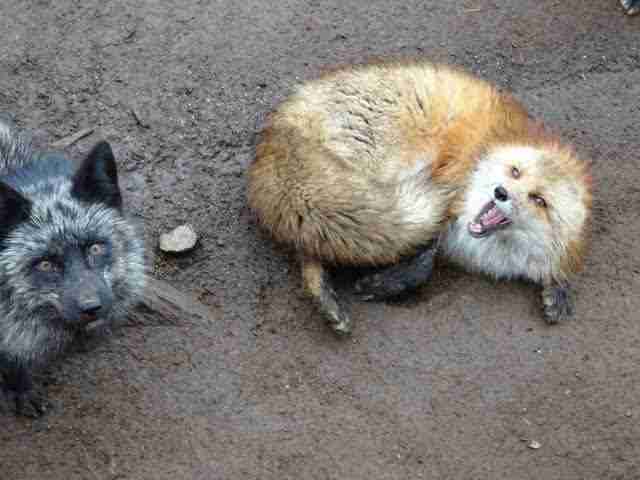 They do not naturally come into contact with humans or, for the most part, other foxes, he said. But with over 100 foxes crammed in such a small fenced-in space, competition is bound to arise between the naturally territorial animals. 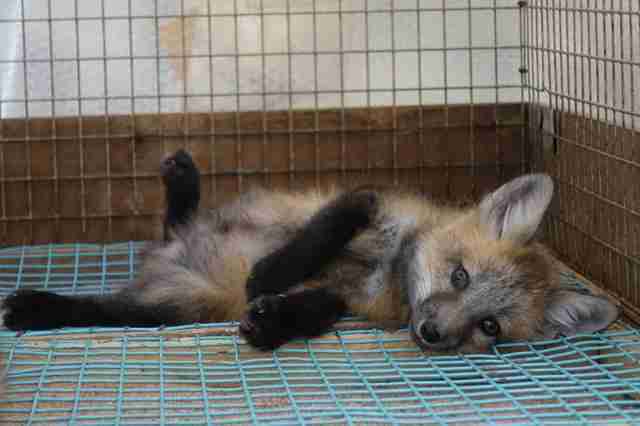 Makiko Nakano, a veterinarian based in Japan who has visited Fox Village, agrees that the environment takes a toll on the animals physically, mentally and emotionally. Davis isn't the only visitor to be shocked by the environment. Numerous reviews on TripAdvisor cite a high density of foxes in the open-air space, a terrible smell and emaciated animals kept in cages. While the open-air space is the main attraction of Fox Village, not all of its animal inhabitants are allowed to roam freely. 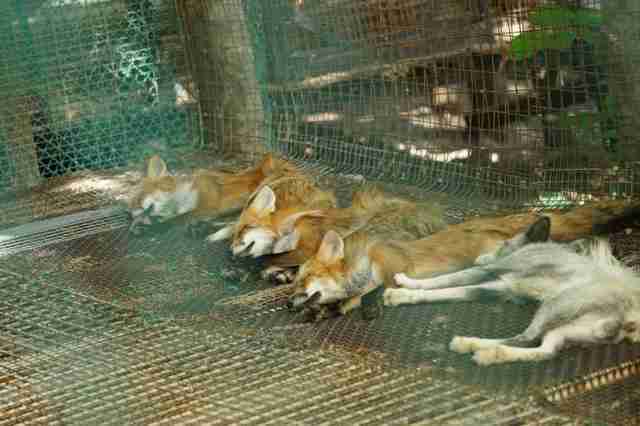 Siphoned off from the central space, there’s a hospital area where sick and injured foxes in wire cages are separated from the general population. 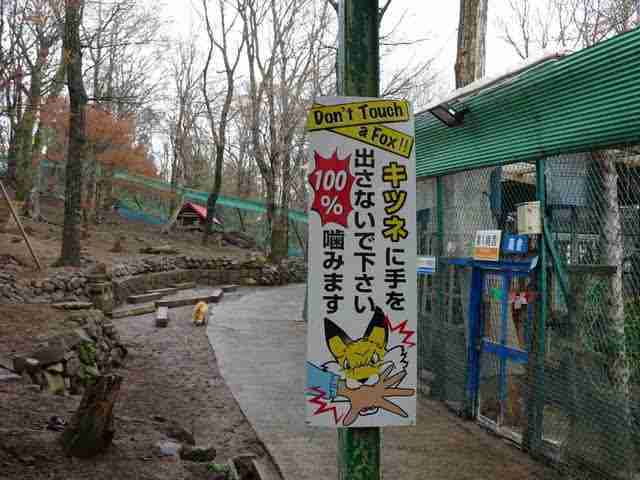 This is also where visitors can pay to snuggle a fox. 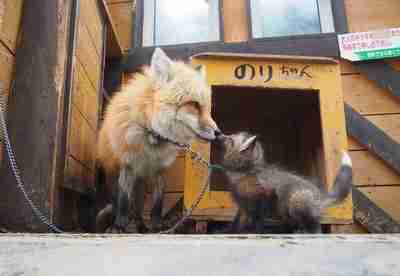 Toward the entrance of the park, newborn foxes and their mothers pace in small wire pens. With dirt floors and only a crude wooden box for privacy, the pens are a far cry from the cozy dens where wild foxes spend their first formative weeks. Typically, a fox kit won’t emerge from his den to play until he is at least 1 month old, and will stay with his parents for a total of seven months before heading out on his own. However, in Fox Village, once the babies are deemed old enough by their caretakers, they “graduate” to a larger wire pen with the other juvenile foxes, and then to the open enclosure. Nakano worries the process happens too quickly. Removing a fox from his mother too early can lead to behavioral problems and other detrimental effects. “Foxes, wolves and coyotes all experience that learning curve with one or both parents, and when an animal is removed from its parent or proper social context, you’ve got a very distorted type of social development in these animals,” Laidlaw said. 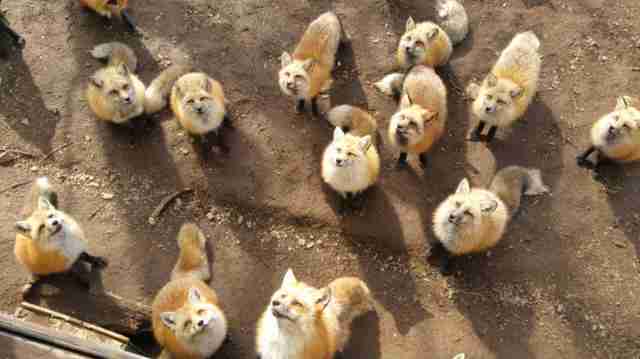 The regular breeding of foxes so as to have young, docile cubs on hand at all times can lead to a surplus of animals. 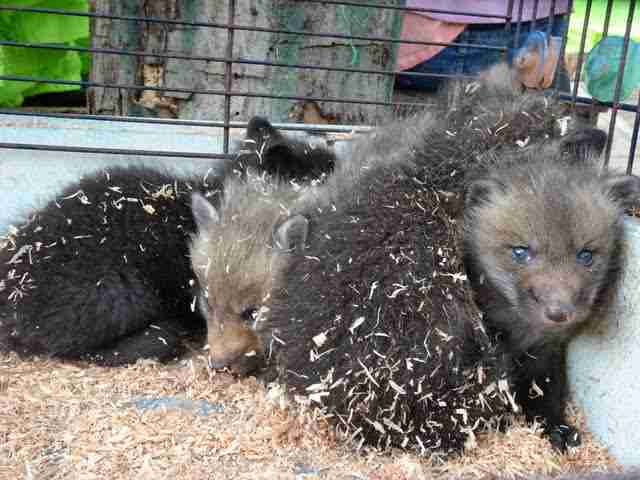 With no regulations or oversight, there’s no way of knowing just how many young foxes wind up at Fox Village, and how many never make it out of their cage. 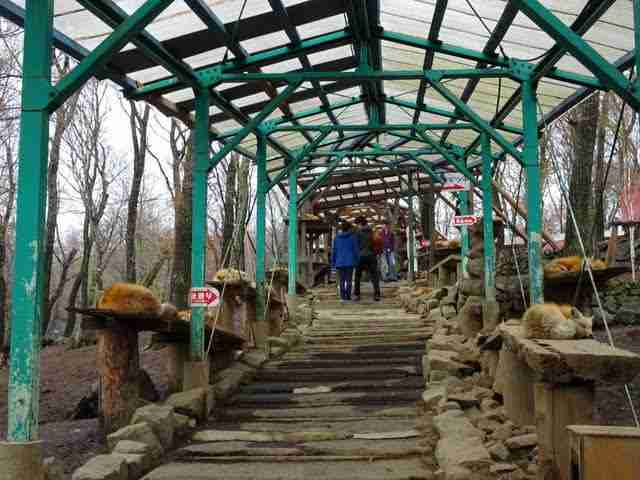 While Fox Village promotes itself as a sanctuary-type establishment that gives “unwanted” foxes a better life, in reality, it is simply a tourist attraction. And though caretakers may be doing the best they can, the foxes are ultimately there for visitors’ entertainment, noted Prashant Khetan, chief executive officer of Born Free USA, an animal advocacy nonprofit. “The moment you start charging people to be entertained by animals, you stop being a sanctuary built around the notion of compassionate conservation, and instead have become a business with the goal of making money,” Khetan told The Dodo. Nothing about the animals’ lives inside Fox Village is natural, and that can be problematic once the animals are no longer useful to the institution. Ending irresponsible breeding practices and keeping wild animals wild is the only way to truly protect foxes, Laidlaw noted.